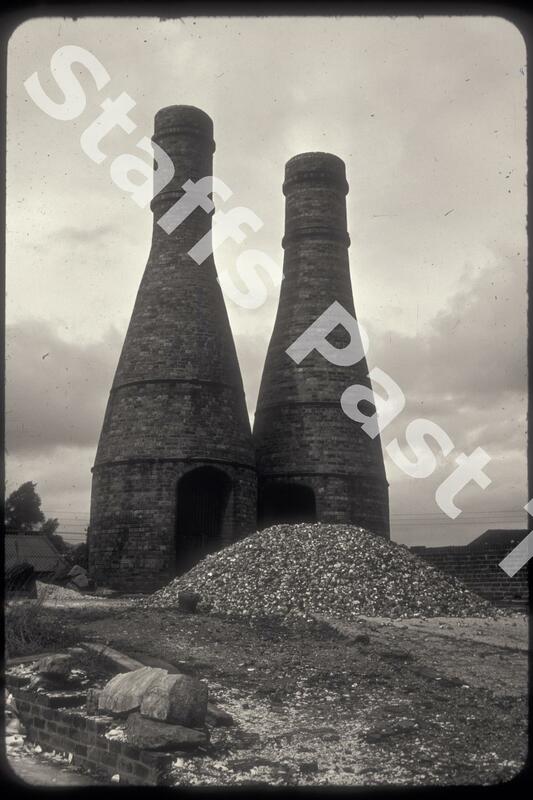 Description:A pair of calcining kilns at George Edwards' Bucknall Flint Mill with their load of flint nodules after roasting (calcining). Adding ground flint and bone (up to 50%), gives ware strength, whiteness and prevents shrinkage during firing to make a hard cream product. Bone gives the china a translucent quality, it is whiter than other ware and its high strength allows it to be thinner. Before the flint or animal bones can be added to the clay body, they have to be crushed to a fine powder. Once calcined, they become brittle and can be crushed more easily. the flints are heated to over 1000 degrees C. Flints are built up in layers of coal using approximately 1 hundredweight (51Kg) of coal for each 1 ton of flint. The mixture is roasted for up to 16 hours. Bone is treated in a similar way, but without the coal.